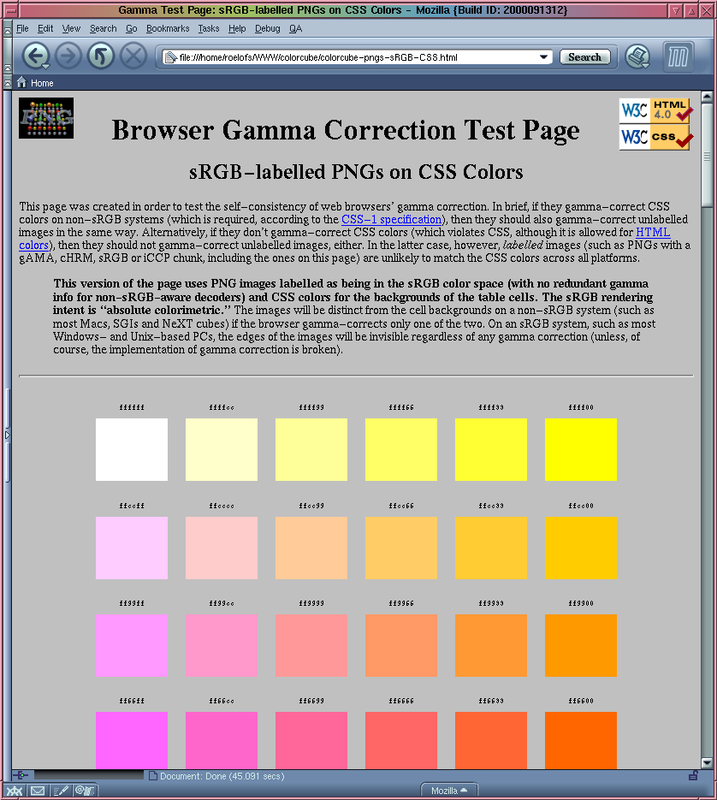 These pages were created in order to test the self-consistency of web browsers' gamma correction. In brief, if they gamma-correct HTML colors on non-sRGB systems (which would be proper, according to the HTML 4.01 specification), then they should gamma-correct unlabelled images in the same way. If they gamma-correct CSS colors on non-sRGB systems (which is required, according to the CSS Level 1 specification), then they also should gamma-correct unlabelled images in the same way. Alternatively, if they don't gamma-correct HTML or CSS colors (which is current practice in almost all web browsers and is conformant behavior in HTML 4.01 but not in CSS), then they should not gamma-correct unlabelled images, either. 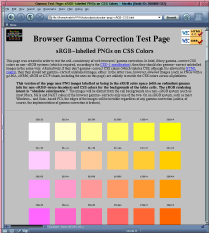 In the latter case, however, labelled images (such as PNGs with a gAMA, cHRM, sRGB or iCCP chunk, or JPEGs with an ICC profile marker) are unlikely to match the HTML colors across all platforms--and, depending on where the images were created, possibly not on any platform. Currently 12 test pages are available. In all but the 1/1.6 and ICC (1/1.0) pairs, the RGB palette values encoded in the images are identical to the RGB hex values used for the table cells; in other words, in eight of the cases, doing no gamma correction on anything will produce self-consistent results on all systems (though with considerable variance between different systems). Doing gamma correction only on the PNG images will produce self-consistent results for all of the tests if and only if the browser believes the display system to be sRGB-like (as on virtually all Windows and Unix PCs); on non-sRGB systems, none of the PNGs will match the background colors. Similar results would hold for browsers that gamma-correct only the CSS colors. The browsers mentioned in this section have not been retested since the second millenium C.E. sRGB-labelled PNGs on HTML colors:           OK      OK      OK? sRGB-labelled PNGs on CSS colors:            no*     OK      OK? OK? = looks OK, but doesn't match 1/2.2 case => ignoring sRGB chunk? Mozilla appears to be fully conformant (except for the newly added ICC-profile images), but keep in mind that this was on an sRGB system. On a Macintosh, it was reported to fail in all but the two GIF cases, which would make sense: as of late 2000, it gamma-corrected only PNGs (bug 53597). A patch has been submitted to extend gamma correction to GIFs, JPEGs, and both HTML and CSS colors, but it did not get into the initial NN 6.x releases (and the browser has not be retested since then). Last modified 21 August 2005. Copyright © 2000-2005 Greg Roelofs.